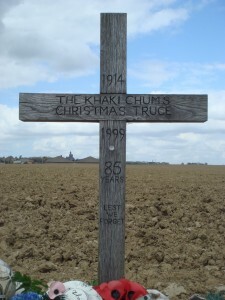 The well-known and illustrated Christmas Truce of 1914 is often considered a unique occurrence within the violence of The Great War. It has been represented in some books and dramatisations as a total cease-fire on Christmas Day, 1914. 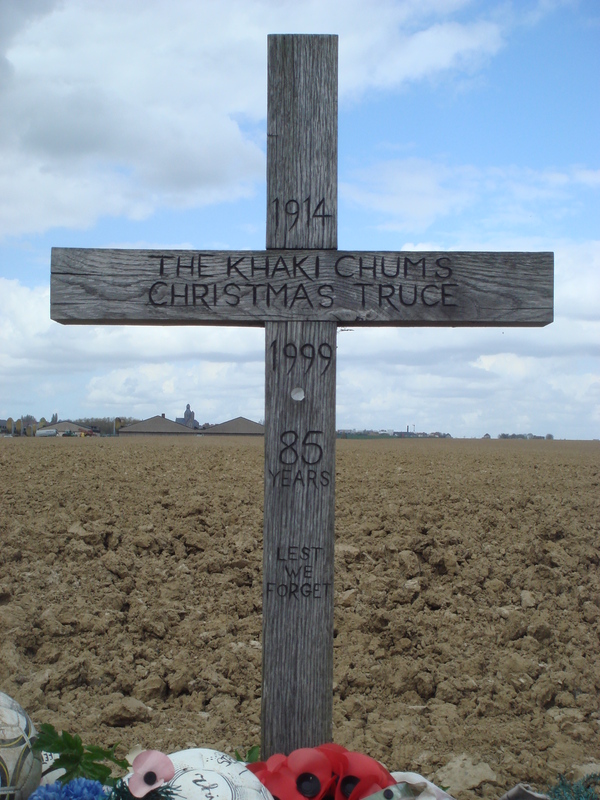 For many years the only tangible representation of the 1914 truce was a wooden cross, placed in 1999 by the Khaki Chums close to Ploegsteert Wood – or Plugstreet as it was known by the British Tommies. On the 4th December 2014 the Belgian people at Messines unveiled a permanent memorial. 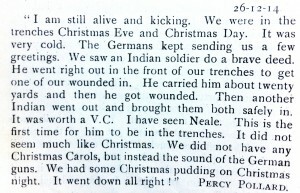 From research into local representation in the Great War, I found a letter in the village of Syston’s Parish Magazine from a Leicestershire soldier, Percy Pollard, dated 26th December 1914. 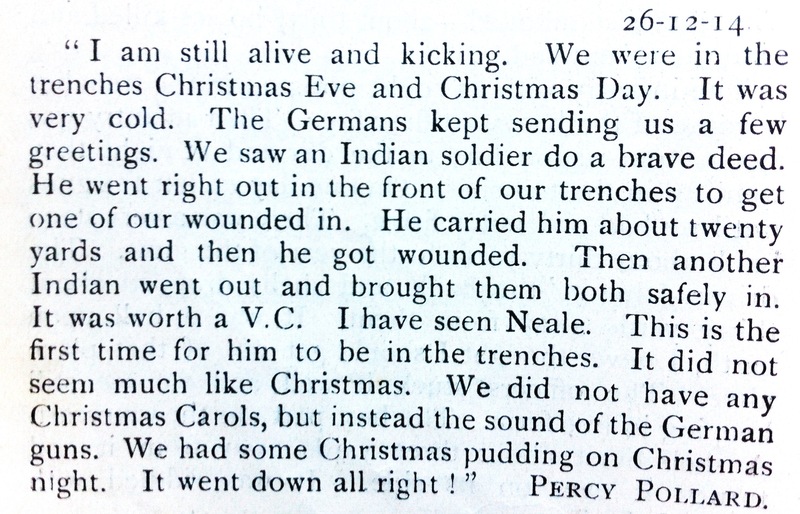 These few lines reveal that all was not quiet along the entire Western Front at Christmas 1914. The legend that a game of football was played between opposing troops is also a matter of conjecture. However, Christmas 1914 is not the only recorded suspension of hostilities during the First World War and a second brief cease-fire may have followed in 1915, but is far less renowned, partly because any fraternisation was strongly discouraged by the military authorities on both sides. The short extract that follows is taken from a paper I presented at an International First World War Conference: ‘Perspectives on the Great War’ at Queen Mary, University of London on 4th August 2014. The paper was prepared using documents that had been deposited at the Leicestershire and Rutland Records office by the relatives of Captain Charles Aubrey Babington Elliott, OBE, JP, of the 8th Battalion, Leicestershire Regiment during the First World War, and Lieutenant-Colonel in the Second. A particularly interesting part of these documents is the correspondence between ‘Cabbie’ Elliott and the German soldier and controversial author, Ernst Jünger. The paper considers if a possible second Christmas Truce in 1915 was indeed fact or fabrication. Documentation of such an event only came to wider attention in 1920 with the publication of Ernst Jünger’s In Stahlgewittern, translated into English in 1929 as Storm of Steel. 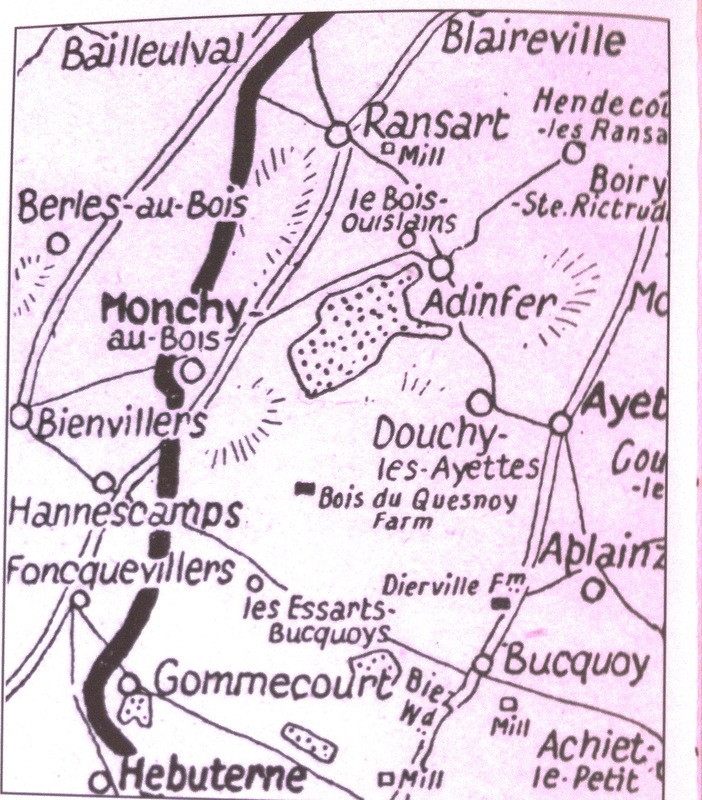 Ernst Jünger was a lieutenant in the 73rd Hanoverian Fusiliers and had been entrenched at Berles-au-Bois, when he took part in an exchange with British soldiers. The weather dominated the writing of both men for quite sometime, speaking of flooded dugouts and a roof dripping like a watering can. He also describes a lively exchange of schnapps, cigarettes and uniform buttons. Hindoostan was super-scribed on the cap badge in recognition of the Regiment’s commendable conduct whilst serving in India between 1804 and 1823. ‘We spent Christmas Eve in the line, and, standing in the mud, sang hymns, to which the British responded with machine-gun fire.’ The War Diary suggests it was sniper fire. 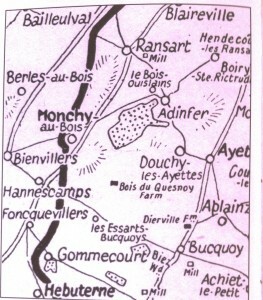 Whilst there is some discontent with Ernst Jünger’s account, and perhaps what happened in December 1915 cannot be considered an accomplished truce but a series of fraternisations, this account is about a fellowship and has culminated in two opposing officers being able to find a personal truce through the written word. Karen Ette, August 2014, abridged version December 2014. Matthew Richardson, Fighting Tigers: Epic Actions of the Royal Leicestershire Regiment (Barnsley: Pen and Sword, 2002), p. 85. ‘There are some swine on your side too!’ Jünger, Storm of Steel, p. 57. Jünger, p. 58-59. The War Diary confirms that rifle grenades were fired by the Leicestershire Regiment.